Lexington, Mississippi. Holmes County Central High School (HCCHS) current and prospective Advanced Placement (AP) Physics 1 students were among 59 students from 10 rural schools who convened in Jackson for the Mississippi Public School Consortium for Educational Access Global Teaching Project (GTP) camp, Jan. 18-21. 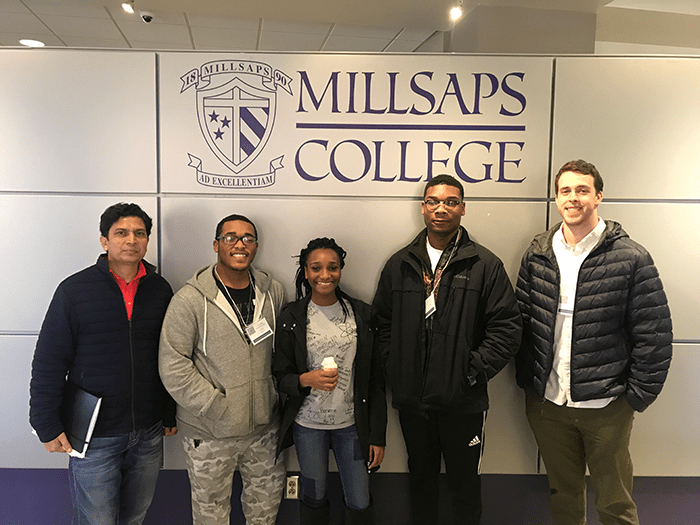 The exciting AP Physics Martin Luther King Holiday weekend was hosted on the Jackson State University and Millsaps College campuses. According to GTP Chief Executive Officer Matthew Dolan, the Holmes County delegation was the largest with three current students and 14 prospective students. Faculty from eight high schools provided instruction or observed. Faculty from HCCHS included Iftikar Azeem and Ravi Dutt. “Both of them were key members of our team,” Dolan stated in a recap of the weekend’s activities. The primary activities of the three-day weekend were physics instruction, including hands-on experiments, observation, data collection, analysis and replication of results in many contexts. However, its agenda also emphasized the importance of the students knowing the Civil Rights struggles and state history. The trip included a visit to the Civil Rights Museum and the Mississippi Museum of History for the current AP Physics students who attended the event. The building Fisher is referring to is The Council of Federated Organizations (COFO) Civil Rights Education Center on JSU’s campus. The Council of Federated Organizations (COFO) was established in 1961 as an umbrella organization to unify and meet the needs of an increasing presence of civil rights organizations in Mississippi. (http://www.jsums.edu/cofo/). During the camp, the students also participated in academic activities in the Margaret Walker Alexander Research Center. At Millsaps College, former Congressman and U.S. Secretary of Agriculture Mike Espy shared his experiences growing up in Mississippi. Espy made history as the state’s first African-American congressman since Reconstruction. Travis Reginal, a graduate of a Mississippi public high school and a member of the Yale College Class of 2016 who is on the Global Teaching Project’s Advisory Board, also addressed the students. Senior Tawanna Jefferson is also excited about the program and the opportunities it has availed her and others from economically deprived communities like Holmes County. During the Jackson trip, she and others shared with media representatives that in their communities they still face some of the same challenges and inequality that Dr. King fought against. “In my county we don’t have all the resources we need,” Jefferson shared. She cited the lack of computers and Wi-fi as challenges for accessing and completing online school work. Yet, Jefferson and others like her find themselves taking advantage of programs such as the Global Teaching Project AP Physics camp as opportunities to sharpen their minds and skills. She is excited about the rollercoaster project she and her partner(s) built during one of the construction exercises in the course of the academic and historic field trip. Their project received praise and applause from attendees. See photos on page 18.